Solar Screens, Parts, Tools & Kits. 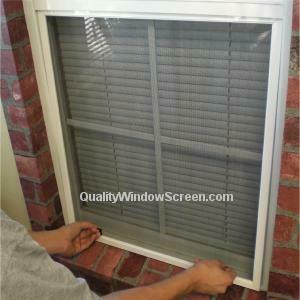 Quality Screen Co., LLC is a one of the top online suppliers and manufacturers of replacement screens for windows, solar sun blocking materials, patio screening, sliding door screens, build and repair parts, hardware, components, tools, mesh & wire, and do it yourself window screen kits. We offer nationwide shipping to your house, home office, apartment, and or company. Take a look at our menu on the left to get started on your replacement screening home improvement project. Custom Size Factory Made Replacement Screens for Windows & Solar Screens! Until now the only way to buy affordable and professional high quality factory made custom replacement screens for windows was to be a home builder or contractor and purchase large quantities of screening products. Now the general public can order online the same high quality fiberglass & aluminum insect screens for windows found on thousands of new homes and apartments at discounted prices similar to factory direct wholesale pricing. Our prices are some of the best online, check out our products online or give us a call to discuss your project. We can assist you with your order today. Quality Screen Co. is one of the most popular choices in custom made factory replacement window, door, patio and solar screens, order your New Window Screens online today. Order Your Replacement Screens Today! Quality Screen Company is one of the most popular choices in custom made factory replacement screens for windows, sliding doors, pet guards, and patios. We also carry some great solar screening materials. We make ordering replacement window screens or solar window screens fast and easy, whether you order one window or solar screen or want to replace or upgrade all the window screens on your home or business. Quality Screen Company offers direct shipment to your front door via Federal Express. Fast delivery of your direct shipped custom replacement window and solar screens is virtually guaranteed. Order Today! Sorry I'm late with review, I ordered screen before porch was complete. It's done and screen looks great and is holding up fine. I plan on holding on to your email address for the future.